Even the Connecticut Audubon Society's Christmas tree farm in Westport didn't escape the effects of Hurricane Sandy. "This year, we've had a lot of damage from the hurricane on our trees, the Douglas firs, so we brought in more pre-cut trees," said Louis Bacchiocchi, who manages the 22-acre farm on Sasco Creek Road, not far from the town's border with Fairfield. He said from 200 to 300 "cut-your-own" trees were damaged by wind and salt spray from Southport Beach and aren't available for sale. "Wind is whipping up all that salt spray and blowing it in," he said of what happened during the late October storm. "We're probably a tenth of a mile from the beach here. We're close." Bacchiocchi said he brought in an extra 50 to 75 pre-cut trees this year to make up for cut-your-own trees that aren't for sale and that the farm, which Audubon's operated since 1985, normally sells between 800 and 1,000 trees a year. He said customers typically buy slightly more cut-your-own trees than pre-cut trees. 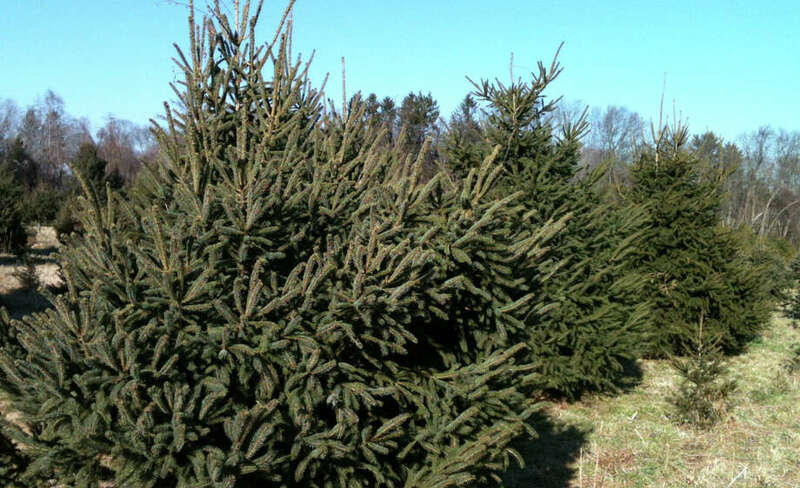 The farm grows white spruce, blue spruce and Douglas firs for customers who want to cut their own tree. Its pre-cut trees are Frazier firs and balsam firs, which the farm can't grow because deer eat the seedlings of those varieties, Bacchiocchi said. The October storm damaged primarily Douglas firs because the white and blue spruces have needles that are waxier and heavier, Bacchiocchi said. "Normally we would have a third of each. This year, because of hurricane damage on the Douglas firs, we probably have more spruce than fir," he said. Linda and Kevin Collins, of Westport, who came to the farm last Friday afternoon in search of a Christmas tree, said they come to the Audubon farm every year for their tree. "The people are very friendly, the trees are always very good, and you don't have to cut your own," Kevin said. "We heard about it 10 years ago. Every year, we get the pre-cuts." Linda said, "They're very fresh trees here." Westporters John and Penny Solum also came to the farm Friday afternoon to buy a pre-cut tree and said they've bought their Christmas tree at the farm for about 15 years. "It's a tradition," John said, adding that he and his wife like to support the Connecticut Audubon Society. Penny said they normally buy a Frazier fir because that type of tree doesn't shed needles like balsams and seems to last longer. She said the Audubon farm, which she visits to bird-watch, always has beautiful trees. Bacchiocchi said one reason customers buy pre-cut trees is because the farm doesn't grow Frazier firs. "A lot of people like a Frazier fir. They are a great tree," he said. "They hold their needles very well. They have a look that a lot of people like." He said he's seen some Frazier Fir Christmas trees last into February. Balsam Firs, he said, smell best but drop more needles. The farm has from 25 to 30 pre-cut trees on-site at any given time and the pre-cuts are nearly as fresh as cut-your-owns because the farm doesn't buy all of its pre-cuts at the same time, Bacchiocchi said. He said the farm normally brings in a total of 300 to 400 pre-cuts a year and is "pretty good at figuring what we need." People's preference for cut-your-own trees seems mostly rooted in tradition and the ability to teach kids that trees don't come from stores, Bacchiocchi said. "What we're hoping to do is show people while an individual tree may be cut, others are planted," he said. He said the farm plants from 1,000 to 1,500 trees a year. Saws are available for people who want to cut their own tree and staffers will help if needed, Bacchiocchi said. The pre-cut trees are up to 10 feet tall and sell for $10 a foot. The cut-your-own trees reach a maximum height of 30 feet and sell for $60 if they're up to 10 feet. For every foot over 10 feet, the price increases by about $10 a foot, Bacchiocchi said. Most customers are looking for a tree that's six to 10 feet tall, but the farm a few weeks ago donated a 20-foot tree to a National Guard Armory and sells other big trees to country clubs and churches, Bacchiocchi said. "We don't sell those at a high price, if you're looking for a big cut-your-own tree," he said. The Christmas tree farm, which is the only one that offers cut-your-own trees in Westport or Fairfield that Bacchiocchi said he's aware of, also sells wreaths, garland, Christmas tree stands and hand-made knick-knacks. Lisa Ludvinsky of Fairfield, who makes wreaths and centerpieces for the farm, said she enjoys helping out the Audubon Society, which receives a percentage of revenue from the Christmas Tree Farm each year, and has made wreaths and similar decorations since she was a kid. "It brings joy for many months during the holiday season," she said of wreaths and centerpieces. "It just helps others enjoy the holiday spirit, gets people into the holiday spirit. I take pride in my work, and I hope whoever gets them enjoys them well after Christmas." On Friday afternoon, a wood-fed fire in a barrel provided warmth to Bacchiocchi and fellow workers. The temperatures weren't too cold, but Bacchiocchi, who's worked at the farm since it opened, said that hasn't always been the case. "If it's cold and windy, it's a long day, especially if it's cold and windy and it's not busy," he said. Connecticut Audubon's Christmas tree farm is open Tuesdays through Fridays from noon to 4 p.m., and on Saturday and Sunday, from 10 a.m. to 4 p.m. The farm is closed Mondays and the last day it is open for the season is Dec. 23.